LBUSD is currently accepting enrollment for the 2018-19 school year. Enrollment for the 2019-20 school year opens April 16, 2019. Please use the list below to find up-to-date enrollment information for your child. For more specific information, please contact the front office of your school of enrollment. The first step in the enrollment process is to verify residency by completing the Residency Declaration and Affidavit and providing supporting documentation. If you are unsure whether you reside within the LBUSD boundaries, use the LBUSD Street Listing. Both forms listed must be printed and filled out. For initial enrollment, the parent or guardian must also provide at least one (1) item from each category 1 and 2 below to support the residency verification form and the residency affidavit. The address on the documents must match the residence property address listed on the residency verification form (P.O. Box addresses are NOT accepted). The address to which these documents were mailed must match the address that is being used to establish residency. Both name and address must appear on payroll stub. If you are a renter and do not pay utilities because it is included in the rent, we will need a letter from the lessor and/or a copy of the rental agreement stating that utilities are included. In the case of purchasing a home under construction, a New Communities K-12 Enrollment Address Verification form may be obtained at the sales office and will be accepted as temporary residency verification. In the event a utility service connection is used as proof of residency, then a utility bill (both parts, in English) must be provided within 45 days to assure continued enrollment. With new student enrollment, you will be asked to enter required information into the system. Please gather the documents listed below and make sure you have this information available before continuing. If you do not have this information available, please return to this online enrollment system when you do. A government issued I.D. with photo. Acceptable documents to show proof of age. Required for certifying up-to-date immunizations for each student. Click the link below for an explanation of the student health requirements for school entry. All forms and information can also be found in the Health Services Department. All kindergarten students must have completed a physical examination no more than six months prior to entering kindergarten. If an exam is completed between six and 12 months prior to kindergarten entrance, another physical exam will be required prior to entering first grade. All first-grade students must have completed a physical examination no more than 18 months prior to first-grade entry. An academic transcript or report card from your previous school. For Special Education students: current or most recent IEP and assessments. For GATE (Gifted And Talented Education) students: prior test scores and/or certification forms. For EL (English Learners) students: a copy of current CELDT scores. **The online process will take approximately 30 minutes to complete and requires a valid email address. You can logout and resume if the process takes longer than expected. Available after online enrollment process is complete. Note: Once you finish reviewing this section, please continue on the "Student Enrollment" section above to begin the enrollment process. According to a California law, Education Code Section 49452.8, all kindergarten and/or first-grade students, whichever is his or her first year in public school, are also required to have an oral health assessment (dental check-up). Oral Health assessments completed up to 12 months before your child enters school will meet this requirement. The law specifies that the assessment must be done by a licensed dentist or other licensed dental health professional. Education Code #48980 requires that at the beginning of each school year, all school districts shall notify parents/guardians of their educational rights and responsibilities under the law. Additionally, LBUSD policy requires that an annual update of student information be completed prior to the first day of school. The LBUSD Data Confirmation Process combines these two requirements within the Aeries Parent Portal. Our Annual Data Confirmation parent information letter will be emailed to all LBUSD families on Monday, August 5, 2019, through our Parent Messaging system in preparation for the new school year. Aeries Parent Portal will open for Data Confirmation on August 7, 2019. Each school year, every family is required to submit a Residency Verification and Affidavit form and one acceptable form of residency verification. 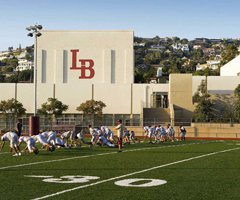 Residency verification is necessary to preserve the quality and safety of the learning environment for students in Laguna Beach, as well as comply with the California Education Code and Laguna Beach Unified School District's Board Policies and procedures. All students who attend LBUSD schools must physically reside at the address listed on student records and within the LBUSD boundaries, unless they have an approved inter-district permit. The most current copy of your Mortgage Statement or Property Tax Statement showing residence address and owner name. ***Please make sure to put your child's last name, first name in the subject line if submitting through email. Education Code section 48982 requires that this notice be signed by the parent/guardian and returned to your child’s school. Your signature on this notice is an acknowledgment that you have received the notice and have been informed of your rights, but the signature does not indicate that consent to participate in any particular program has been either given or withheld. California and United States law requires certain other notices in the event that specific circumstances should arise, affecting your child’s education and attendance at school. If any such circumstances should arise, the District will provide notice as required by law. When a student who is zoned to another school district wants to attend a LBUSD school, his/her parent/guardian must request an Interdistrict Transfer Agreement from the HOME DISTRICT (such as Capistrano, Newport-Mesa, Saddleback, etc.). The Home District is considered the district the student is zoned to according to residence address/location. The Interdistrict Transfer Agreement form is typically located on the Home District's website. The parent/guardian completes Section 1 of the form. The Home District completes and approves Section 2. The form is then delivered to LBUSD by the parent or the Home District. LBUSD reviews and either approves or denies the request. Most of these requests are DENIED. The only exception is if the student’s parent/guardian is a full-time (6 hours per day or more), permanent employee of LBUSD. The parent/guardian must be a direct employee of the district, not simply work in the vicinity of the district for another company/entity in Laguna Beach. Additionally, if a student has attended LBHS through the first semester of 11th grade and subsequently moves out of the district boundaries, they may request and be approved to attend LBHS to complete the second semester of their 11th grade as well as their 12th grade year. LBUSD Instructional Services office completes Section 3 of the form. If the student meets at least one of the above two exceptions, the form is marked APPROVED and copies are sent to the parent and the Home District. If the student does not meet at least one of the above two exceptions, the form is marked DENIED and a letter informing the parent/guardian of this decision, and their right to appeal, is mailed to the parent and a copy is sent to the Home District. When a student who is zoned to attend Laguna Beach USD wishes to attend a school in another district, his/her parent/guardian must complete an Interdistrict Transfer Agreement form. This form is available on our website under the “Enrollment” and “Interdistrict” tabs. The form is divided into three sections. The parent/guardian completes Section 1 and submits it to the LBUSD Instruction Office. The form can be completed online or filled out in person at the district office. For students who are not currently enrolled at LBUSD, we require proof of residency to confirm that they reside within LBUSD boundaries. Most of these requests are APPROVED automatically. The exception includes those requesting to attend charter schools or county programs. These requests are reviewed on a case-by-case basis prior to approval to ensure awareness by the school of attendance. Once approved by LBUSD, Section 2 of the form is completed by the Instruction Office with the appropriate “decision” box selected. The approved request form is sent to the corresponding district (whichever district the child is requesting admittance to). A COPY of the form is mailed to the parent/guardian to advise that their request has been approved by LBUSD and it is now in the hands of the district of request. At this point, the turn-around time for the original form and final decision for admittance depends on the corresponding district. If there are questions regarding this step of the process, the parent must contact the corresponding district directly. Once the corresponding district completes Section 3 of the form, copies are distributed appropriately. A copy of the form is filed in our district records. If the corresponding district denies the student’s request for admittance into their schools, the parent/guardian must address this with the denying district. Parent is then responsible for enrollment within LBUSD. Please print the Residency Verification and Affidavit form listed below. Complete all pages of the form and submit them with your "Proof of Residency" documents. Each person between the ages of 6 and 18 years not exempted under the provisions of this chapter or Chapter 3 (commencing with Section 48400) is subject to compulsory full-time education. Each person subject to compulsory full-time education and each person subject to compulsory continuation education not exempted under the provisions of Chapter 3 (commencing with Section 48400) shall attend the public full-time day school or continuation school or classes and for the full time designated as the length of the school day by the governing board of the school district in which the residency of either the parent or legal guardian is located and each parent, guardian, or other person having control or charge of the pupil shall send the pupil to the public full-time day school or continuation school or classes and for the full time designated as the length of the school day by the governing board of the school district in which the residence of either the parent or legal guardian is located. Unless otherwise provided for in this code, a pupil shall not be enrolled for less than the minimum school day established by law. Notwithstanding Section 48200, a pupil complies with the residency requirements for school attendance in a school district, if he or she is any of the following: (1) (A) A pupil placed within the boundaries of that school district in a regularly established licensed children's institution, or a licensed foster home, or a family home pursuant to a commitment or placement under Chapter 2 (commencing with Section 200) of Part 1 of Division 2 of the Welfare and Institutions Code. (B) An agency placing a pupil in a home or institution described in subparagraph (A) shall provide evidence to the school that the placement or commitment is pursuant to law. (2) A pupil who is a foster child who remains in his or her school of origin pursuant to subdivisions (f) and (g) of Section 48853.5. (3) A pupil for whom inter-district attendance has been approved pursuant to Chapter 5 (commencing with Section 46600) of Part 26. (4) A pupil whose residence is located within the boundaries of that school district and whose parent or legal guardian is relieved of responsibility, control, and authority through emancipation. (5) A pupil who lives in the home of a caregiving adult that is located within the boundaries of that school district. Execution of an affidavit under penalty of perjury pursuant to Part 1.5 (commencing with Section 6550) of Division 11 of the Family Code by the caregiving adult is a sufficient basis for a determination that the pupil lives in the home of the caregiver, unless the school district determines from actual facts that the pupil is not living in the home of the caregiver. (6) A pupil residing in a state hospital located within the boundaries of that school district. (7) A pupil whose parent or legal guardian resides outside of the boundaries of that school district but is employed and lives with the pupil at the place of his or her employment within the boundaries of the school district for a minimum of three days during the school week.